The well-documented decline in labor force participation (people who are either working or looking for work) suggests that the economy is not as robust as the low unemployment rate indicates, and a number of researchers have explored whether disabilities and health problems have played a role in the decline. People with disabilities have much lower employment rates than those without disabilities—35 percent of people with disabilities ages 16-64 worked in 2009 compared to 72 percent of those without disabilities—and disabilities are one of the most commonly cited reasons for not working. Krueger found that almost half of prime-age men (those ages 25 to 54) who are not in the labor force take pain medication on a daily basis, and Case and Deaton hypothesize that economic shifts have reduced labor market demand and wages for those with less than a bachelor’s degree, “with cascading effects” on marriage, health, and mortality. Eberstadt notes that disability benefits offer an alternative source of income and make it financially possible to withdraw from the labor market, even if we cannot say that such benefits are the reason people stop working. In a recent report, my co-author Natalie Holmes and I examine who is out-of-work in 130 of America’s large cities and counties, and one of the characteristics we examine is disability. The largest group among the out-of-work (38 percent) is what we call “less-educated, prime age people,” referring to those with a high school diploma or less and most of whom (83 percent) are between the ages of 25 and 54. Among the less-educated prime age group, the most common type of disability is ambulatory, with nine percent describing themselves as having serious difficulty with walking or climbing stairs. Seven percent report a cognitive disability (serious difficulty remembering, concentrating, or making decisions). Six percent report difficulty with independent living (doing errands alone such as a visiting a doctor’s office or shopping). Note: The types of disability add up to greater than 16 percent because people can have more than one disability. Notably, none of those reporting a disability in our analysis of the out-of-work receive federal disability benefits through Supplemental Security Income (SSI) or Social Security Disability Insurance (SSDI). Since our goal was to identify people likely to benefit from or be interested in workforce development services, we excluded those receiving disability benefits. To meet the criteria for disability benefits, by definition, a person must demonstrate that they are unable to work because of a physical or mental impairment. Thus, while we are not able to judge the severity of a disability among the out-of-work in our analysis, they are more likely to want to enter or re-enter the work world than those receiving disability benefits. At the jurisdictional level, disability rates among the less-educated prime-age group show quite a range, from a low of 4 to 5 percent (Gwinnett County, GA and Hidalgo County, TX) to a high of 38 percent in Johnson County, KS. 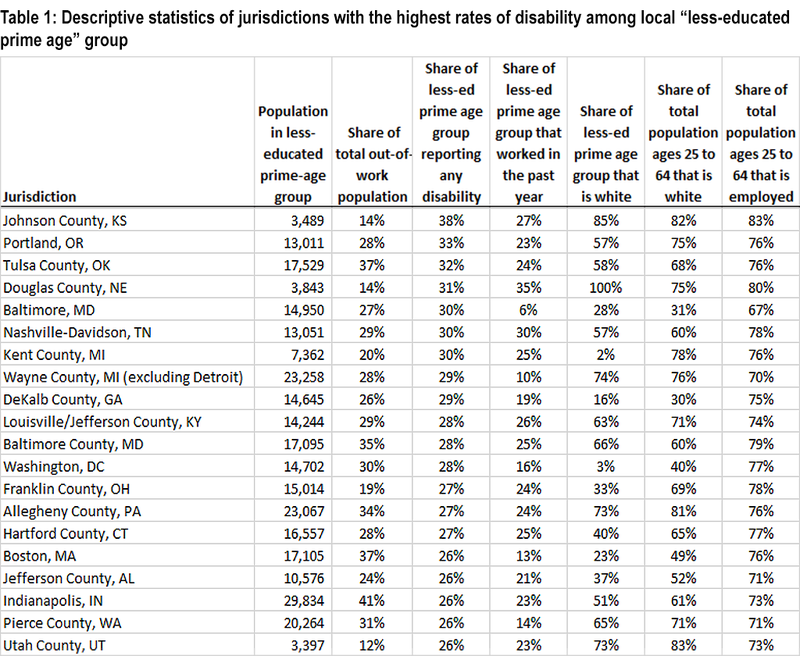 Jurisdictions with the highest disability rates among the less-educated prime age group are primarily counties rather than cities, and cluster in the Midwest and South. Most of these jurisdictions are majority white, and show a mix of tight and slacker labor markets; more than half have employment rates above the national average of 73 percent for 25-64 year-olds. People in the less-educated prime age groups are primarily in the 35 to 54 age range, but sizable shares (more than one-third) are ages 55-64 as well in many of the jurisdictions. The most common disabilities are ambulatory, cognitive, and difficulty with independent living. Other disabilities include difficulties with vision, hearing, and self-care (bathing and dressing). Of course, disability is a complex topic. The data presented here identify an individual’s specific functional limitations, but they do not specify underlying health conditions. Moreover, the question of whether these limitations act as a barrier to employment also depends upon environmental factors—such as employers’ willingness to hire people with disabilities (and if necessary, offer reasonable accommodations) and whether educational and employment-related services are accessible to people with disabilities. Under a commonly used framework, disability is conceptualized as a gradient on which people function at different levels due to personal and environmental factors, rather than a binary choice of disabled/not disabled. Nonetheless, these data highlight the need for programs and policies to increase employment among people with disabilities. Nonetheless, these data highlight the need for programs and policies to increase employment among people with disabilities. A number of program models exist, including social enterprises and strong partnerships between workforce development organizations and employers. There are also centers providing resources to help organization’s improve or develop their efforts to assist people with disabilities in finding employment. Others note, however, that few programs and evaluations focus on people with disabilities before they apply for disability benefits, and that any employment program for people with disabilities is swimming upstream in the context of federal disability policy that emphasizes income support and disincentivizes employment. Two assessments of the research on approaches to increase employment among people with disabilities came to similar conclusions: they called for “bolder initiatives” and “more ambitious ideas” rather than incremental change, as well better evidence of impact and the use of pilot programs to test new approaches. In fact, those recommendations are a good starting point for any discussion of workforce development and strategies to help the out-of-work, regardless of their disability status. The author thanks Ethan Andrews for his assistance in analyzing the data.